Common causes include insect bites and stings, foods, and medications. Other causes include latex exposure and exercise. Additionally cases may occur without an obvious reason. The mechanism involves the release of mediators from certain types of white blood cells triggered by either immunologic or non-immunologic mechanisms. 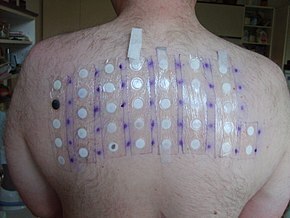 Diagnosis is based on the presenting symptoms and signs after exposure to a potential allergen. ^ a b c d e f g h i j k l m n o p q r s t u v w x y Simons, FE; Ardusso, LR; Bilò, MB; El-Gamal, YM; Ledford, DK; Ring, J; Sanchez-Borges, M; Senna, GE; Sheikh, A; Thong, BY; World Allergy, Organization. (February 2011). "World allergy organization guidelines for the assessment and management of anaphylaxis". The World Allergy Organization journal. 4 (2): 13–37. doi:10.1097/wox.0b013e318211496c. PMC 3500036  . PMID 23268454. ^ a b Tintinalli, Judith E. (2010). Emergency Medicine: A Comprehensive Study Guide (Emergency Medicine (Tintinalli)). New York: McGraw-Hill Companies. pp. 177–182. ISBN 0-07-148480-9. ^ Ma, L; Danoff, TM; Borish, L (April 2014). "Case fatality and population mortality associated with anaphylaxis in the United States". The Journal of Allergy and Clinical Immunology. 133 (4): 1075–83. doi:10.1016/j.jaci.2013.10.029. PMC 3972293  . PMID 24332862. ^ a b c d e f Simons FE (October 2009). "Anaphylaxis: Recent advances in assessment and treatment". The Journal of Allergy and Clinical Immunology. 124 (4): 625–36; quiz 637–8. doi:10.1016/j.jaci.2009.08.025. PMID 19815109. ^ a b c d e Triggiani, M; Patella, V; Staiano, RI; Granata, F; Marone, G (September 2008). 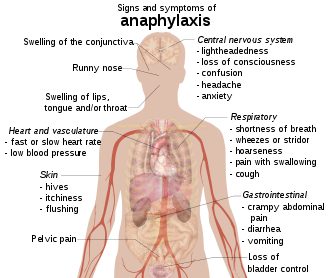 "Allergy and the cardiovascular system". Clinical and Experimental Immunology. 153 Suppl 1 (s1): 7–11. doi:10.1111/j.1365-2249.2008.03714.x. PMC 2515352  . PMID 18721322. ^ a b c d e f g Boden, SR; Wesley Burks, A (July 2011). "Anaphylaxis: a history with emphasis on food allergy". Immunological Reviews. 242 (1): 247–57. doi:10.1111/j.1600-065X.2011.01028.x. PMC 3122150  . PMID 21682750. ^ Worm, M (2010). "Epidemiology of anaphylaxis". Chemical Immunology and Allergy. 95: 12–21. doi:10.1159/000315935. ISBN 978-3-8055-9441-7. PMID 20519879. ^ a b editors, Marianne Gausche-Hill, Susan Fuchs, Loren Yamamoto, (2007). The pediatric emergency medicine resource (Rev. 4. ed.). Sudbury, Mass. : Jones & Bartlett. p. 69. ISBN 978-0-7637-4414-4. Archived from the original on 2016-12-23. ^ a b editor, Mariana C. Castells, (2010). Anaphylaxis and hypersensitivity reactions. New York: Humana Press. p. 223. ISBN 978-1-60327-950-5. Archived from the original on 2016-12-23. ^ "Adverse Effects of Vaccines: Evidence and Causality" (PDF). U.S. Institute of Medicine. 2011. Archived from the original on 2017-09-08. Retrieved 2014-01-16. ^ Feldweg, AM (May 2015). "Exercise-Induced Anaphylaxis". Immunology and Allergy Clinics of North America (Review). 35 (2): 261–75. doi:10.1016/j.iac.2015.01.005. PMC 4542991  . PMID 25841550. ^ a b Pravettoni, V; Incorvaia, C (2016). "Diagnosis of exercise-induced anaphylaxis: current insights". Journal of asthma and allergy. 9: 191–198. doi:10.2147/JAA.S109105. PMC 5089823  . PMID 27822074. ^ a b Simons FE, Ebisawa M, Sanchez-Borges M, Thong BY, Worm M, Tanno LK, Lockey RF, El-Gamal YM, Brown SG, Park HS, Sheikh A (2015). "2015 update of the evidence base: World Allergy Organization anaphylaxis guidelines". The World Allergy Organization journal. 8 (1): 32. doi:10.1186/s40413-015-0080-1. PMC 4625730  . PMID 26525001. ^ a b c Lieberman P (September 2005). "Biphasic anaphylactic reactions". Ann. Allergy Asthma Immunol. 95 (3): 217–26; quiz 226, 258. doi:10.1016/S1081-1206(10)61217-3. PMID 16200811. ^ a b c d Ring, J; Behrendt, H; de Weck, A (2010). "History and classification of anaphylaxis" (PDF). Chemical Immunology and Allergy. Chemical Immunology and Allergy. 95: 1–11. doi:10.1159/000315934. ISBN 978-3-8055-9441-7. PMID 20519878. ^ Halbrich, M; Mack, DP; Carr, S; Watson, W; Kim, H (2015). "CSACI position statement: epinephrine auto-injectors and children < 15 kg". Allergy, Asthma, and Clinical Immunology. 11 (1): 20. doi:10.1186/s13223-015-0086-9. PMC 4485331  . PMID 26131015. ^ a b Tejedor-Alonso M, A; Moro-Moro, M; Múgica-García, MV (2015). "Epidemiology of Anaphylaxis: Contributions From the Last 10 Years". Journal of investigational allergology & clinical immunology. 25 (3): 163–75; quiz follow 174–5. PMID 26182682. This page was last edited on 1 June 2018, at 03:56 (UTC).